Living at home as long as possible is a major goal for many older adults, and it becomes a more popular option the older we get. According to the AARP, 71% of 50- to 64-year old Americans want to keep living in their own homes as they age. For adults 65 and older, the percentage jumps to 87%. To make life at home a long-term reality, you or someone you care for may need extra help to cook healthy meals, move around safely, or run errands. In-home care services can help with those tasks and more, allowing seniors to live at home safely and comfortably and offering peace of mind to adult children and other family members who live too far away to visit often. The median average yearly cost of full-time homemaker services across the US is $45,760, according to figures from the 2016 Genworth Cost of Care Survey. Alaska is the state with the highest yearly median cost of in-home care. Full-time homemaker services there cost $59,488 per year. Louisiana has the nation’s lowest median cost of in-home care, with full-time homemaker services costing $34,892 annually. Eligible veterans and surviving spouses who need assistance with activities of daily living may qualify for the VA Aid & Attendance Pension benefit, which can help cover in-home care costs. In general, there are two kinds of in-home care: homemaking and home health assistance. Homemaking services are usually priced just a bit lower than home health aide and focus on home and personal care tasks: bathing, dressing, and grooming along with important daily tasks such as preparing meals, keeping the house clean, doing laundry, and running errands. Other options can include plant care, pet care, help with correspondence and bills, and scrapbooking and social time. Home health aides may have a license or certificate, depending on the requirements in the state where you live. In addition to homemaking tasks, these workers are trained to monitor their clients’ health and keep track of things like meals, hydration, exercise, and mood. They may also help patients with mobility challenges, turn bed-bound patients to prevent the development of pressure sores, and help facilitate communication among the patient, family members, and healthcare providers. Both types of care providers can be hired full-time, part-time or for in-home respite care. Respite care is a way for family caregivers to take a break from their caregiving responsibilities to take care of themselves, and it’s recommended that family members take respite breaks to prevent burnout. In-home respite care allows the client to remain at home rather than moving to an assisted living facility for short-term respite services. For seniors with complex ongoing health needs and for those recovering at home after a major illness, injury, or surgery, other home health professionals may be needed. These can include home health nurses and a number of types of therapists, like physical and occupational therapists for stroke or surgical patients, respiratory therapists for patients with lung issues, and speech therapists for post-stroke speech recovery or for seniors who have difficulty swallowing food and liquid. Seniors who are facing a life-limiting illness and wish to remain at home can benefit from the care of in-home hospice aides and nurses. These caregivers are trained to help the patient and his or her family with physical and emotional needs at the end of life, and they also monitor the patient’s comfort level and administer prescribed pain medications. The Genworth Cost of Care Survey tracks the cost of 2 types of in-home care: homemaker services (such as cooking, light housekeeping and laundry) and home health aide services (which include medication management, blood pressure checks, and other health procedures). The average national rates, based on a full-time schedule of 44 hours per week every week of the year, are $125 per day ($3,805 per month or $45,760 per year) for homemaker services. Average rates are a bit higher for home health aide services ($127 per day; $3,861 per month; or $46,332 per year). It’s important to know, though, that those are just average figures, and the actual cost will depend on going rates in your state. For example, the average monthly rate for full-time homemaker services is $3,241 in Mississippi, but $4,576 in Hawaii. Your city matters, too. Home health aide services run an average of $4,385 per month in Stockton, California, but that figure rises to $5,720 per month in San Francisco. There are other factors to consider when you’re looking at your care budget, too. Hiring caregivers through an agency typically costs more than hiring individual caregivers, but agencies shoulder the burden of taxes, payroll, bonds, background checks, and insurance for their workers. And you may need a caregiver for fewer or more than 44 hours per week. The A&A application process can take several months to complete, and benefit funds will not be available during the processing period. (Applicants over the age of 90 can include a request for expedited approval with their application.) However, people whose A&A application is approved will receive retroactive benefits dating back to the original application date. These are paid out as a lump sum, followed by regular monthly benefit payments. 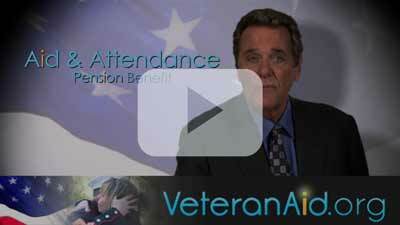 On VeteranAid.org you can find details on the Aid and Attendance program and application process.